Case study of stainless steel components of a geothermal heating system failed prematurely. The crack surfaces were brittle in appearance and were predominately transgranular. The failure was determined to be caused by chloride induced stress corrosion cracking. Subsequent failures may be avoided by informed alloy selection. More informations : Transgranular stress corrosion cracking of 304L stainless steel pipe clamps in direct use geothermal water heating applications. High pressure pipe failed by fatigue in the fusion line of longitudinal weld. Fatigue was caused by vibration of the line due to clamp missing. Crack initiated and propagated through the high concentration region of weld joint. Change of specified material (UNS S31803) by AISI 304L contributed to the failure. As recommendation, seamless tube of duplex stainless steel must be used. 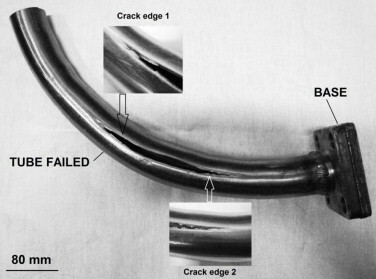 More informations : Fatigue cracking of high pressure oil tube. In this study, failure analysis of rocker liners used for charging system of Blast Furnace was carried out. The failed rocker liner samples shows non-uniform distribution of carbides, resulted in variation of hardness as well as wear properties. After proper heat-treatment and chemistry modification, the Rocker Liner obtained high hardness (with uniformity) due to proper distribution of carbide phases in the tempered martensitic matrix. Thus proper heat treatment is needed to achieve optimum property with changing the material composition to deal with this stringent working condition. Rocker liner with modified microstructure was trailed in the Blast Furnace and it has given a life of around 20-22 months life. More informations : Failure Analysis of Rocker Liner used as a charging system of Blast Furnace. The damage of the inelastic coating was more serious than the elastic coating. The failure causes of the antistatic coating on the radome were analyzed. The results show that the failure of inelastic and elastic antistatic coatings was caused by particles erosion, and the aging of the coatings accelerated the failure of coatings. The elastic coating had better anti-erosion ability than the inelastic coating because of its high fracture elongation and good elastic deformation, so its damage was lighter than the inelastic coating. More informations : Failure Analysis on antistatic coatings on Radome. Contrôle des soudures par ultrasons multi-éléments : la recherche avance ! Les techniques de contrôle non destructif par ultrasons multi-éléments sont largement étudiées pour le contrôle des cordons de soudure, en particulier sur les tubes en acier ou en polyéthylène. Cette nouvelle note de veille du Cetim présente les résultats de travaux de recherche récents sur le sujet. Highlights : Microbes cause significant damage in oil and gas engineering structures. 16S rRNA gene sequence indicates the presence of mixed bacterial consortium. Biotic system, confirms the presence of various oxides of Iron. IRB consortium exhibits inhibitory action on the corrosion process. Pitting was much more evident in the abiotic system than the biotic system. More informations : The shielding effect of wild type iron reducing bacterial flora on the corrosion of linepipe steel. More informations : Failure analysis of a pinion of the jacking system of a jack-up platform. We believe that the journal fills an important niche in the market. Other professions such as medicine and the law make great use of case studies, but engineers have not really formalised this to the same extent. It may be that our education tends to lead us to the view that all problems can be solved based on “First Principles” or through a program of rigorous scientific experimentation. But it has long been my belief that an enormous amount can be gained by studying how things behave in practice, and there is no better teacher than failure. more : Case Studies in Engineering Failure Analysis. Le Cetim vient de mettre en ligne dans la Mécatech cinq nouveaux cas d’analyses de défaillances mettant en cause des défauts de surface provenant de la matière ou apparus en service : des couronnes laminées, un ensemble ressort de machine textile, un embout de circuit hydraulique, des rampes de compression et un tube hydraulique. 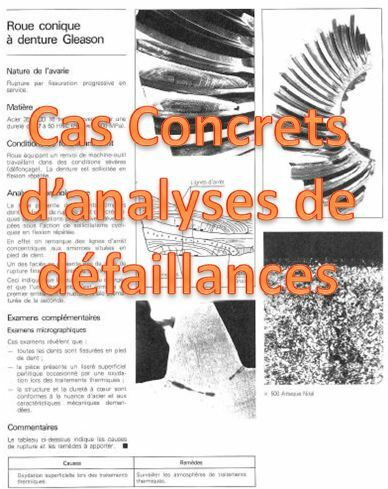 Cas Concrets – Des défauts de surfaces – Cetim – Centre technique des industries mécaniques.